Our fourth most popular version. The retail price is $14.95 for 70 pages. 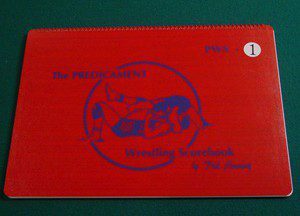 Nine percent of the books we sell are PWS1’s. The PWS1 is basically the front half of a PWS3 as it does not contain Form C.
It is designed for teams that computerize their individual wrestler stats and don’t need our Form C.
It is designed for one team level for one season. There are 6 detailed instruction pages. There are 52 pages of our Form B. There are 2 pages of our Form D.
There are 4 pages of our Form E.
There are 4 pages of our Form F.
There are 2 blank blue divider pages.